Objectives To review the evidence for the efficacy and safety of biological agents in patients with rheumatoid arthritis (RA) to provide data to develop treatment recommendations by the European League Against Rheumatism (EULAR) Task Force. Methods Medline, Embase and Cochrane databases were searched for relevant articles on infliximab (IFX), etanercept (ETN), adalimumab (ADA), certolizumab-pegol (CZP), golimumab (GLM), anakinra (ANA), abatacept (ABT), rituximab (RTX) and tocilizumab (TCZ) published between 1962 and February 2009; published abstracts from the 2007–2008 American College of Rheumatology (ACR) and EULAR conference were obtained. Results 87 articles and 40 abstracts were identified. In methotrexate (MTX) naïve patients, biological therapy with IFX, ETN, ADA, GLM or ABT has been shown to improve clinical outcomes (level of evidence 1B). In MTX/other synthetic disease-modifying antirheumatic drug (DMARD) failures all nine biological agents confer benefit (1B), with lower efficacy noted for ANA. RTX, ABT, TCZ and GLM demonstrate efficacy in tumour necrosis factor inhibitor (TNFi) failures (1B). Less evidence exists for switching between IFX, ETN and ADA (3B). Biological and MTX combination therapy is more efficacious than a biological agent alone (1B). A safety review shows no increased malignancy risk compared with conventional DMARDs (3B). TNFi are generally associated with an increased risk of serious bacterial infection, particularly within the first 6 months of treatment initiation; increased tuberculosis (TB) rates with TNFi are highest with the monoclonal antibodies (3B). Conclusions There is good evidence for the efficacy of biological agents in patients with RA. Safety data confirm an increased risk of bacterial infection and TB with TNFi compared with conventional DMARDs. Biological disease-modifying antirheumatic drugs (DMARDs) for the treatment of rheumatoid arthritis (RA) have led to remarkable patient benefits. Initial development of cytokine-blocking treatments, tumour necrosis factor inhibitor (TNFi) agents and an interleukin 1 (IL-1) receptor antagonist, has been followed by drugs targeting alternative molecules and pathways, including B-cell depletion and T-cell costimulation agents. More recently, drugs targeting the IL-6 receptor and another two TNFi have been approved in the USA or Europe, or both. The scope of the literature search was outlined by the EULAR Task Force. A subgroup of this committee (see author list) focused on the role of biological DMARDs in the treatment of RA. A systematic literature search was performed from 1962 to February 2009 using Medline, Embase and Cochrane databases. Studies evaluating nine biological DMARDs: infliximab (IFX), etanercept (ETN), adalimumab (ADA), certolizumab-pegol (CZP), golimumab (GLM), anakinra (ANA), abatacept (ABT), rituximab (RTX) and tocilizumab (TCZ) were included. Abstracts were also obtained from the 2007–8 American College of Rheumatology (ACR) and EULAR conferences. Where full papers of these abstracts were published online during this period, the latter were obtained and used for data extraction. Details of the search terms and search strategy can be found in the online supplementary material. Existing meta-analyses and SLRs were obtained. Where research questions were not covered by systematic reviews, original studies were found. The criteria for study selection for efficacy analysis were (1) double-blind randomised controlled trials (RCTs); (2) patients with RA; (3) studies evaluating one of the nine biological DMARDs mentioned above; (4) trials of ≥6 months' duration; (5) studies with ≥50 patients; (6) publications in English. Safety aspects were evaluated using information from large cohorts with long-term follow-up data rather than those from RCTs. Criteria used for study selection to evaluate toxicity were (1) registries and observational studies; (2) inclusion of a control group; (3) report of incidence of events in the context of population-based expected incidences. Data were extracted and checked independently by two of the authors (JLN and MHB). Discrepancies were resolved by discussion. For efficacy analysis, studies were grouped according to the following patient categories consistent with current clinical practice and trial design: (1) no prior DMARD use (DMARD naïve); (2) no prior MTX use (MTX naïve); (3) inadequate response to MTX (MTX-IR); (4) incomplete response to any synthetic DMARD which may not necessarily include MTX (mixed DMARD-IR); (5) TNFi failure (TNF-IR). Studies included and details of efficacy outcome measures extracted can be found in the online supplementary material. Efficacy data were analysed using Review Manager (RevMan version 5.0, Copenhagen: The Nordic Cochrane Centre, The Cochrane Collaboration, 2008) software and expressed as relative risks (RRs) or standardised mean differences (SMDs). While these data were obtained and are depicted in the figures for each individual drug, for the majority of biological agents and most of the patient categories there were no major differences between the RR or SMD. Results of individual RCTs were therefore also pooled using a Dersimonian and Laird random-effects model; where appropriate, only these group results are mentioned in the ‘Results’ section and readers are referred to the figures for the results obtained for individual biological agents. The number needed to treat (NNT) was also calculated from the pooled results, which represent the number of patients who need to be treated with a drug to gain one additional positive outcome.2 Statistical heterogeneity was assessed using the I2 statistic. Toxicity data were not subject to formal statistical analysis. Levels of evidence were assigned according to the Oxford Centre for Evidence-based Medicine levels of evidence (http://www.cebm.net/index.aspx?o=1025, accessed 29 March 2010). Of 11 458 published articles that were screened, 87 articles and 40 abstracts met inclusion criteria. The efficacy and safety data are summarised by addressing clinical questions posed by the task force. Efficacy outcomes included in the article relate to signs and symptoms, with figures for the ACR20 responses shown by way of example. Efficacy data for radiographic outcomes and physical function (Health Assessment Questionnaire (HAQ)) will be mentioned—details on these, other clinical outcomes and quality of life measures (Physical Component Score and Mental Component Score of the Short Form-36); fatigue (FACIT score) can be found in the online supplementary material. (1.1) In patients who have received no prior DMARDs (DMARD naïve), what is the evidence for the efficacy of biological DMARD therapy? There were no studies fulfilling inclusion criteria for analysis in this group. Although one RCT showed benefit using IFX and MTX versus MTX alone, fewer than 50 patients were studied.3 A larger open labelled strategy trial4 also assessed the use of biological DMARDs in DMARD-naïve patients—and is addressed in a SLR on the strategic approach to the management of RA with DMARDs.4a (ref – Rachel's SLR). Several studies in the MTX-naïve group however include a large proportion of DMARD-naïve patients and will be discussed here. (1.2A) In patients who have received no prior MTX (MTX naïve), what is the evidence for the efficacy of biological DMARD+MTX combination therapy? RCTs of five biological DMARDs (ABT, ADA, ETN, GLM and IFX) in MTX-naïve patients were included. Six-month ACR response from one trial on GLM,5 showed superior efficacy when starting treatment with a biological DMARD+MTX versus MTX alone with RR for the ACR20 and 50 responses of 1.25 (95% CI 1.04 to 1.49) and 1.31 (95% CI 0.99 to 1.72), respectively (figure 1A). The pooled RR for the 12-month ACR20 response from four studies on ADA,6 7 ETN8 and IFX9 was 1.24 (95% CI 1.15 to 1.34) (I2=18%) with a NNT of 7.1 (95% CI 5.0 to 11.1). The overall RR for the 12-month ACR50 and 70 responses for five studies on ABT,10 ADA,6 7 ETN8 11 and IFX9 were 1.43 (95% CI 1.30 to 1.56) (I2=0%) and 1.63 (95% CI 1.45 to 1.83) (I2=0%) with NNT of 7.1 (95% CI 4.8 to 12.5) and NNT of 6.3 (95% CI 5.0 to 7.7), respectively. (A) Risk ratios for the ACR20 responses at 12 months comparing the use of a biological disease-modifying antirheumatic drug (DMARD) plus methotrexate (MTX)† versus MTX monotherapy†† in patients with early rheumatoid arthritis (RA) who are MTX naïve*. (B) Risk ratios for the ACR20 responses at 12 months comparing the use of biological DMARD monotherapy† versus MTX monotherapy†† in patients with early RA who are MTX naïve*. ACR, American College of Rheumatology; †, treatment; ††, control; *Klareskog 2004 TEMPO (6 years' disease duration; > 2/3 MTX naïve): RR=1.13 (95% CI 1.03 to 1.24). Disease Activity Score 28 (DAS28) remission rates were also higher with the use of biological DMARD+MTX therapy in this group with a pooled RR for DAS28 remission at 12 months of 1.78 (95% CI 1.57 to 2.02) (I2=0%) and a NNT of 5.9 (95% CI 4.5 to 8.3). Radiographic data at 12 months showed less progression for ABT,10 ADA,7 ETN8 and IFX9 in combination with MTX than for MTX monotherapy. Rates of radiographic non-progression were higher for ABT,10 ADA7 and ETN8 combination therapy. Improvements in HAQ at 12 months were also greater for ABT,10 ADA,6 7 and IFX9 in combination with MTX. (1.2B) In patients who have received no prior MTX (MTX naïve), what is the evidence for the efficacy of biological DMARD monotherapy? Six-month ACR responses from one trial on GLM5 showed similar efficacy when starting treatment with a biological DMARD versus MTX alone with the RR for the ACR20 and 50 responses 1.04 (95% CI 0.84 to 1.3) and 1.1 (95% CI 0.8 to 1.55), respectively. Twelve-month ACR20 responses from two studies on ADA7 and ETN11 showed a RR=0.87 (95% CI 0.74 to 1.03) and 1.22 (95% CI 1.06 to 1.4), respectively; overall RR=0.98 (95% CI 0.76 to 1.26) (figure 1B). The RR for the ACR50 and 70 responses from one study on ADA7 were 0.89 (95% CI 0.78 to 1.08) and 0.92 (95% CI 0.7 to 1.22). Change in the modified Sharp score was lower for ADA7 than for MTX monotherapy at 12 months with greater numbers achieving radiographic non-progression. From one RCT12 the numbers of patients achieving non-progression were similar for ETN and MTX. (1.3A) In patients who have had inadequate response to MTX (MTX-IR), what is the evidence for the efficacy of biological DMARD+MTX combination therapy? Efficacy data exist for all nine biological DMARDs studied in the MTX-IR group (figure 2A). Six-month ACR responses pooled from 16 trials,13,–,28 comparing a biological DMARD with placebo in combination with background MTX showed overall RR for the ACR20, 50 and 70 at 6 months of 2.16 (95% CI 1.83 to 2.55) (I2=77%), 3.20 (95% CI 2.6 to 3.95) (I2=54%) and 4.82 (95% CI 2.43 to 9.57) (I2=33%), respectively. The corresponding NNT were 3.2 (95% CI 2.4 to 4.0), 4.2 (95% CI 3.6 to 4.8) and 7.7 (95% CI 6.7 to 10.0). The RR for the 12-month ACR20, 50 and 70 responses pooled from seven studies on ABT,15 29 ADA,17 CZP,21 IFX,30 RTX26 and TCZ31 were 2.47 (95% CI 1.99 to 3.07) (I2=72%), 3.64 (95% CI 2.74 to 4.83) (I2=52%) and 4.79 (95% CI 3.65 to 6.29) (I2=0%), respectively. The corresponding NNT were 3.0 (95% CI 2.6 to 3.6), 3.7 (95% CI 3.2 to 4.2) and 5.9 (95% CI 5.0 to 6.7). (A) Risk ratios for the ACR20 responses at 6 months comparing the use of a biological disease-modifying antirheumatic drug (DMARD) plus methotrexate (MTX)† versus MTX monotherapy†† in patients with rheumatoid arthritis (RA) who are MTX incomplete responders. (B) Risk ratios for the ACR20 responses at 6 months comparing the use of biological DMARD monotherapy† versus MTX†† in patients with rheumatoid arthritis (RA) who are MTX incomplete responders. ACR, American College of Rheumatology; †, treatment; ††, control. Radiographic progression at 12 months was lower for patients receiving combination therapy with MTX and ABT,15 ADA,17 CZP,21 IFX30 and TCZ31 versus control. The 12-month improvement in HAQ scores was greater with combination MTX and the biological DMARDs ABT,15 ADA,17 CZP21 and RTX32 versus control. (1.3B) In patients who have had inadequate response to MTX (MTX-IR), what is the evidence for the efficacy of biological DMARD monotherapy? Pooled RR from two trials on GLM24 and RTX26 for 6-month ACR20, 50 and 70 responses were 1.43 (95% CI 1.06 to 1.93) (I2=10%), 1.71 (95% CI 1.02 to 2.88) (I2=12%) and 2.32 (95% CI 1.09 to 4.54) (I2=0%), respectively, when starting treatment with a biological DMARD monotherapy versus continuing MTX (figure 2B). The corresponding NNT were 6.7 (95% CI 2.9 to not estimable), 9.1 (95% CI 4.2 to not estimable) and 14.3 (95% CI 7.7 to not estimable). RR for the 12-month ACR20, 50 and 70 responses from the study on RTX26 showed a RR=1.63 (95% CI 0.76 to 3.49), 2.5 (95% CI 0.51 to 12.14) and 7 (95% C1 0.37 to 131.28). Numbers for the study, however, were small and CI wide. ACR20, 50 and 70 responses at 24 months were 0.60 (95% CI 0.15 to 2.34), 0.75 (95% CI 0.18 to 3.14) and 0.33 (95% CI 0.04 to 3.07), respectively, showing similar efficacy between biological and synthetic DMARD monotherapy. (1.4A) In patients who have had inadequate response to a synthetic DMARD, not necessarily MTX (mixed DMARD-IR), what is the evidence for the efficacy of biological+synthetic DMARD combination therapy? Six-month ACR20, 50 and 70 responses from four trials on ADA,33 ETN,34 RTX35 and TCZ36 assessed the use of a biological DMARD compared with placebo in combination with background synthetic DMARD therapy (figure 3A). Pooled RR for ACR20, 50 and 70 responses were 2.06 (95% CI 1.52 to 2.78) (I2=82%), 3.19 (95% CI 2.38 to 4.27) (I2=43%) and 5.44 (95% CI 3.74 to 7.91) (I2=0%), respectively. The corresponding NNT were 3.2 (95% CI 0.2 to 5.3), 4.0 (95% CI 3.0 to 5.9) and 6.3 (95% CI 5.0 to 8.3). Twelve-month RR for ACR20, 50 and 70 responses from one study on ETN37 were 1.13 (95% CI 1.03 to 1.24), 1.60 (95% CI 1.35 to 1.90) and 2.27 (95% CI 1.67 to 3.09), respectively. DAS remission at 6 months from the same study showed a RR=2.2 (95% CI 1.50 to 3.22) for combination therapy with ETN versus MTX alone. The RR for DAS and DAS28 remission at 12 months were 2.65 (95% CI 1.85 to 3.81) and 2.23 (95% CI 1.65 to 3.06), respectively. (A) Risk ratios for the ACR20 responses at 6 months comparing the use of a biological plus synthetic disease-modifying antirheumatic drug (DMARD)† versus synthetic DMARD monotherapy†† in patients for whom a synthetic DMARD (not necessarily MTX) has failed. (B) Risk ratios for the ACR20 responses at 6 months comparing the use of biological DMARD monotherapy† versus synthetic DMARD monotherapy/placebo†† in patients for whom a synthetic DMARD (not necessarily MTX) has failed. ACR, American College of Rheumatology; †, treatment; ††, control. Greater improvements were seen in HAQ scores at 6 months with RTX35 and TCZ36 combination therapy than with synthetic DMARD alone. (1.4B) In patients who have had inadequate response to a synthetic DMARD, not necessarily MTX (mixed DMARD-IR), what is the evidence for the efficacy of biological DMARD monotherapy? 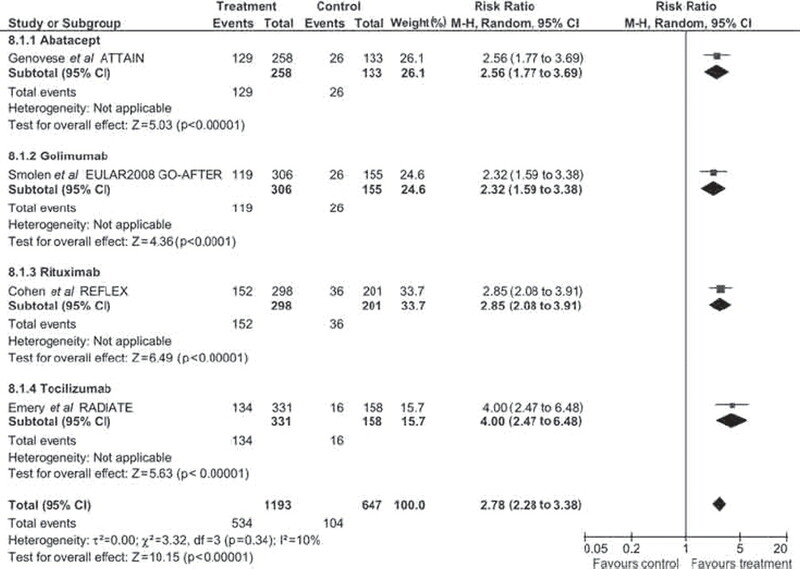 Six-month ACR20 responses from six trials on ADA,38 ANA,39 CZP40,ETN34 41 and TCZ42 showed a pooled RR=2.50 (95% CI 1.56 to 4.02) (I2=90%) and NNT of 3.2 (95% CI 2.4 to 5.3) comparing treatment with a biological DMARD with control; in three studies38 39 41 the control group received placebo alone with no synthetic DMARD (figure 3B). The overall RR for the 6-month ACR50 and 70 responses for ADA,38 CZP,40 ETN34 41 and TCZ42 were 3.51 (95% CI 1.57 to 7.84) (I2=88%) and 5.50 (95% CI 0.9 to 33.56) (I2=0%), respectively with corresponding NNT of 4.3 (95% CI 3.2 to 7.1) and 7.1 (95% CI 5.3 to 12.5). Twelve-month ACR20, 50 and 70 responses from 1 study on ETN37 showed a RR=1.01 (95% CI 0.91 to 1.12), 1.12 (95% CI 0.91 to 1.37) and 1.28 (95% CI 0.9 to 1.02). The RR for DAS28 remission for one study on TCZ42 as monotherapy compared with MTX at 6 months was 2.81 (95% CI 1.92 to 4.12). At 12 months, the RR for DAS28 remission in 1 study, ETN44 was 1.02 (95% CI 0.68 to 1.53). At 12 months radiographic progression was lower for ETN37 and TCZ43 monotherapy compared with synthetic DMARD alone and for ANA45 compared with placebo. Six-month improvements in HAQ were greater for ADA38 and ANA39 than placebo, and for CZP46 than synthetic DMARD. (1.5) In patients who have had inadequate response to a TNF inhibitor (TNF-IR), what is the evidence for the efficacy of combination therapy with an alternative biological DMARD+MTX? In patients for whom ADA, ETN and IFX have failed, the search found no RCTs on switching between these three established TNFi. A literature review by Carmona et al47 documented 29 reports on switching from one TNFi to another in RA. Overall, the data indicated benefit of switching from a first TNFi to a second; with switching for secondary non-response likely to be more effective. A systematic review by Lopez-Olivo et al48 reported similar findings. 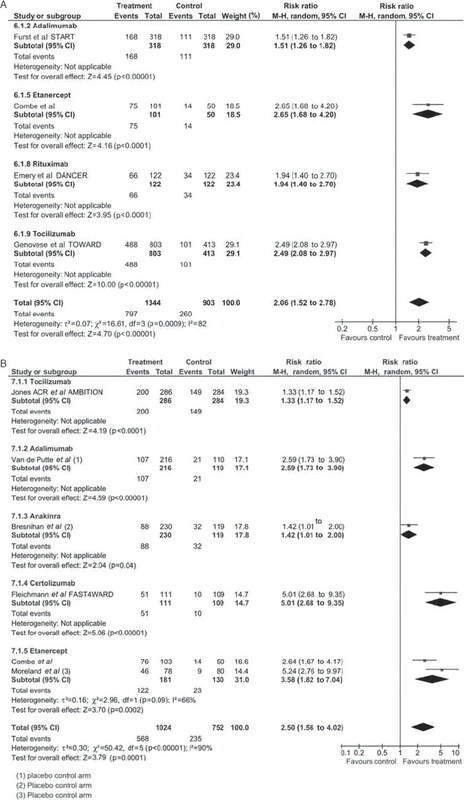 Several RCTs have evaluated non-TNF targeted biological DMARDs after TNFi failure, and most recently an alternative TNFi has also been assessed; ABT,49 GLM,39 RTX50 and TCZ51 have all shown efficacy. Overall RR for the ACR20, 50 and 70 responses at 6 months when comparing the addition of an alternative biological DMARD to an existing synthetic DMARD with continuing a synthetic DMARD alone were 2.78 (95% CI 2.28 to 3.38) (I2=10%), 5.00 (95% CI 3.45 to 7.24) (I2=0%) and 8.27 (95% CI 3.65 to 18.76) (I2=0%), respectively (figure 4). The corresponding NNTs were 3.4 (95% CI 2.4 to 4.2), 5.6 (95% CI 4.8 to 6.7) and 11.1 (95% CI 9.1 to 14.3). The RR for achieving low disease activity for ABT,49 RTX50 and TCZ51 at 6 months was 6.59 (95% CI 4.01 to 10.82) (I2=0%); RR for DAS28 remission for TCZ51 was 10.02 (95% CI 3.20 to 31.42). Risk ratios for the ACR20 responses at 6 months comparing the use of a biological disease-modifying antirheumatic drug (DMARD) plus methotrexate (MTX)† versus MTX†† in patients with rheumatoid arthritis (RA) who are tumour necrosis factor inhibitor incomplete responders. ACR, American College of Rheumatology; †, treatment; ††, control. Improvement in HAQ at 6 months was higher with a synthetic DMARD plus ABT,36 49 GLM,52 RTX50 or TCZ53 than a control. (2) Is combination therapy with a biological agent plus MTX better than biological DMARD monotherapy? Risk ratios for the ACR20 responses at 6 months comparing the use of a biological plus synthetic disease-modifying antirheumatic drug (DMARD)† versus biological DMARD monotherapy†† in RA. ACR, American College of Rheumatology; †, treatment; ††, control. Radiographic progression at 12 months was lower for combination therapy for ADA7 plus MTX versus ADA monotherapy and ETN plus MTX37 versus ETN alone. Improvements in HAQ was also greater with ADA7 and MTX combination therapy versus ADA alone. (3) What are the safety concerns to consider when starting a biological DMARD? Longer-term data evaluating the safety of biological DMARDs have become available with their increasing use. The majority of the evidence pertains to IFX, ETN and ADA. A summary of the findings relating to specific safety aspects will be presented in this article. Further details with tables including reported standardised incidence ratios and RRs are available in the online supplementary material. Six published papers and two abstracts from registries and retrospective studies regarding infection were reviewed (table 7, online supplementary section). Several registries and databases have documented an increased risk of serious bacterial infections with the use of biological DMARDs compared with patients not treated with these drugs57 58; in particular, increased rates of pneumonia were seen, greatest within first 6 months of treatment initiation.57 58 HAQ, older age, comorbidity and past hospitalisation predicted subsequent hospitalisation for infection.58 Data published by Wolfe et al59 suggested a greater hospitalisation risk for pneumonia in patients with RA receiving prednisolone rather than with the use of TNFi and MTX. UK registry data60 have shown increased rates of serious skin and soft tissue infections with TNFi, and when limiting analysis to the first 90 days after the start of biological agents, found significantly increased risks for all serious infections when compared with synthetic DMARDs.61 No difference in infection rates between ADA, ETN or IFX was reported. From French registry data62 an increase in the risk of Legionella has been reported in patients receiving TNFi compared with the general population. Four published papers and three abstracts from registries and retrospective studies regarding TB were reviewed (table 8, online supplementary section). Five published papers and seven abstracts on malignancy were reviewed (table 9, online supplementary section). One published paper and one abstract from registries on interstitial lung disease (ILD) were reviewed (table 11, online supplementary section). Analysis of data by Wolfe et al82 showed no increase in the risk of development of new ILD on treatment; HR were 0.7 (0.4; 1.3) for IFX and 0.9 (0.4; 1.7) for ETN. From UK registry data83 baseline RA-ILD, irrespective of TNFi therapy, was a predictor of increased all-cause mortality. In patients with baseline RA-ILD, TNFi were associated with a worse all-cause and RA-ILD-specific mortality; standardised mortality ratio 2.93 (95% CI 2.14 to 3.99) compared with those receiving TNFi without ILD at baseline. Optimal use of complex and effective biological agents warrants a systematic review of the literature. This analysis provided data to inform treatment recommendations for the EULAR Task Force. In essence, it demonstrates the benefits of biological DMARDs, confirming a favourable efficacy/safety profile and highlights areas in need of further evaluation. In particular, it shows that few studies have formally evaluated the use of biological DMARDs in DMARD-naïve patients, with one pilot study showing benefit with combination IFX therapy.3 Further efficacy data, however, may be extrapolated from studies in the MTX-naïve group: MTX is often the first preferred synthetic DMARD and, where reported, between 50%11 and 97%10 of patients in these RCTs were also DMARD naïve. An Oxford based level of evidence 2B has therefore been assigned for efficacy of biological DMARDs in this group. In contrast, biological DMARDs have been more systematically evaluated in patients who are either (1) MTX naïve; (2) MTX failures and (3) other synthetic DMARD failures, with RCT data providing evidence for each of these groups (Oxford level of evidence 1B). Several SLRs and meta-analyses provide further supportive evidence (level 1A) for IFX,84 85 ETN86 and ADA87 individually and as a group of established TNFi,88,–,96 for ANA,89 93,–,96 ABT97,–,99 and TCZ100 for the use of biological DMARDs in patients with RA. Less efficacy has been noted for ANA in several meta-analyses,89 93,–,96 than for the other biological DMARDs. Although the RR for the use of biological DMARDs is generally higher in the groups for whom synthetic DMARDs have failed compared with those who were MTX naïve, different treatment comparisons are relevant; the former group compares the use of a new treatment—the biological DMARD—with an existing failed synthetic DMARD (therefore essentially, a placebo-controlled trial), whereas the latter group compares the start of two new treatment regimens—a biological DMARD in the treatment arm and a synthetic DMARD (usually MTX) in the comparator group. Response to a TNFi is not universal30; there may be benefit from switching to an alternative TNFi, although the literature on this comprises smaller, non-controlled studies (level of evidence 3B). The newer biological DMARDs (ABT, RTX and TCZ) and, most recently, the newer TNFi GLM, have demonstrated efficacy compared with placebo in this TNFi-resistant group (level of evidence 1B). The decision on which agent to switch to after initial TNFi failure still remains unclear with no head-to-head comparisons undertaken to date. Use of the biological DMARDs has been evaluated both as monotherapy and in combination with concomitant synthetic DMARDs. Review of the literature confirms the efficacy of combination therapy. In patients who may not tolerate MTX or another synthetic DMARD, however, biological DMARD monotherapy—with the exceptions of ABT (for which no RCT data were available) and IFX—has demonstrated efficacy. It also substantiates the superiority of combination treatment over biological DMARD monotherapy with particular evidence for the TNFi7 and RTX26 (level of evidence 1B), supporting this approach wherever possible. Although a 20-week study56 has demonstrated efficacy of both TCZ monotherapy and combination therapy, further comparative studies assessing synergy of TCZ with a synthetic DMARD compared with TCZ monotherapy have not been undertaken to date. We acknowledge that there are several limitations to this literature review. To evaluate the efficacy of all the current biological DMARDs, data on outcomes were extracted and results pooled. Studies were grouped and statistical methods applied to minimise heterogeneity. Trials, however, differed to various degrees in their patient selection, study design, inclusion criteria and treatment regimens. Accordingly, the pooled risk estimates across studies should be interpreted with caution and direct head-to-head comparisons between the biological DMARDs cannot be made. Nevertheless, it is clear that there is good evidence for the overall benefit of biological DMARDs in RA. In summary, review of the literature confirms the efficacy of biological DMARDs in the treatment of RA. Continued vigilance and recording of future safety signals is important as well as the collection of safety data on the more recently introduced non-TNF biological DMARDs. Future studies should provide additional guidance for the use of biological DMARDs in early RA as well as the management of those for whom TNFi fail. The authors would like to thank Liz Neilly, University of Leeds Library Health Faculty Team librarian for her advice and help with the literature search.
. EULAR recommendations 2010 for the management of rheumatoid arthritis with synthetic and biological disease modifying antirheumatic drugs. Ann Rheum Dis 2010;69:964–975.
. Confidence intervals for the number needed to treat. BMJ 1998;317:1309–12.
. Very early treatment with infliximab in addition to methotrexate in early, poor-prognosis rheumatoid arthritis reduces magnetic resonance imaging evidence of synovitis and damage, with sustained benefit after infliximab withdrawal: results from a twelve-month randomized, double-blind, placebo-controlled trial. Arthritis Rheum 2005;52:27–35.
. Clinical and radiographic outcomes of four different treatment strategies in patients with early rheumatoid arthritis (the BeSt study): a randomized, controlled trial. Arthritis Rheum 2005;52:3381–90.
. Golimumab (GLM), a new human anti-TNF-alpha monoclonal antibody, administered subcutaneously (SC) every 4 weeks in methotrexate-naive patients with active rheumatoid arhtirits (RA): a randomised, double-blind, placebo-controlled, GO-BEFORE study. Ann Rheum Dis 2008;67:179.
. Effect of the early use of the anti-tumor necrosis factor adalimumab on the prevention of job loss in patients with early rheumatoid arthritis. Arthritis Rheum 2008;59:1467–74.
. The PREMIER study: a multicenter, randomized, double-blind clinical trial of combination therapy with adalimumab plus methotrexate versus methotrexate alone or adalimumab alone in patients with early, aggressive rheumatoid arthritis who had not had previous methotrexate treatment. Arthritis Rheum 2006;54:26–37.
. Comparison of methotrexate monotherapy with a combination of methotrexate and etanercept in active, early, moderate to severe rheumatoid arthritis (COMET): a randomised, double-blind, parallel treatment trial. Lancet 2008;372:375–82.
. Combination of infliximab and methotrexate therapy for early rheumatoid arthritis: a randomized, controlled trial. Arthritis Rheum 2004;50:3432–43.
. Clinical efficacy and safety of abatacept in methotrexate-naive patients with early rheumatoid arthritis and poor prognostic factors. Ann Rheum Dis 2009;68:1870–7.
. A comparison of etanercept and methotrexate in patients with early rheumatoid arthritis. N Engl J Med 2000;343:1586–93.
. Etanercept versus methotrexate in patients with early rheumatoid arthritis: two-year radiographic and clinical outcomes. Arthritis Rheum 2002;46:1443–50.
. Efficacy and safety of abatacept or infliximab vs placebo in ATTEST: a phase III, multi-centre, randomised, double-blind, placebo-controlled study in patients with rheumatoid arthritis and an inadequate response to methotrexate. Ann Rheum Dis 2008;67:1096–103.
. Treatment of rheumatoid arthritis by selective inhibition of T-cell activation with fusion protein CTLA4Ig. N Engl J Med 2003;349:1907–15.
. Effects of abatacept in patients with methotrexate-resistant active rheumatoid arthritis: a randomized trial. Ann Intern Med 2006;144:865–76.
. A randomized, double-blind, placebo-controlled, phase III study of the human anti-tumor necrosis factor antibody adalimumab administered as subcutaneous injections in Korean rheumatoid arthritis patients treated with methotrexate. APLAR J Rheumatol 2007;10:9–16.
. Radiographic, clinical, and functional outcomes of treatment with adalimumab (a human anti-tumor necrosis factor monoclonal antibody) in patients with active rheumatoid arthritis receiving concomitant methotrexate therapy: a randomized, placebo-controlled, 52-week trial. Arthritis Rheum 2004;50:1400–11.
. Adalimumab, a fully human anti-tumor necrosis factor alpha monoclonal antibody, for the treatment of rheumatoid arthritis in patients taking concomitant methotrexate: the ARMADA trial. Arthritis Rheum 2003;48:35–45.
. Treatment of rheumatoid arthritis with anakinra, a recombinant human interleukin-1 receptor antagonist, in combination with methotrexate: results of a twenty-four-week, multicenter, randomized, double-blind, placebo-controlled trial. Arthritis Rheum 2002;46:614–24.
. A multicentre, double blind, randomised, placebo controlled trial of anakinra (Kineret), a recombinant interleukin 1 receptor antagonist, in patients with rheumatoid arthritis treated with background methotrexate. Ann Rheum Dis 2004;63:1062–8.
. Certolizumab pegol plus methotrexate is significantly more effective than placebo plus methotrexate in active rheumatoid arthritis: findings of a fifty-two-week, phase III, multicenter, randomized, double-blind, placebo-controlled, parallel-group study. Arthritis Rheum 2008;58:3319–29.
. Efficacy and safety of certolizumab pegol plus methotrexate in active rheumatoid arthritis: the RAPID 2 study. A randomised controlled trial. Ann Rheum Dis 2009;68:797–804.
. A trial of etanercept, a recombinant tumor necrosis factor receptor: Fc fusion protein, in patients with rheumatoid arthritis receiving methotrexate. N Engl J Med 1999;340:253–9.
. Golimumab, a human antibody to tumour necrosis factor (alpha) given by monthly subcutaneous injections, in active rheumatoid arthritis despite methotrexate therapy: the GO-FORWARD Study. Ann Rheum Dis 2009;68:789–96.
. Infliximab (chimeric anti-tumour necrosis factor alpha monoclonal antibody) versus placebo in rheumatoid arthritis patients receiving concomitant methotrexate: a randomised phase III trial. ATTRACT Study Group. Lancet 1999;354:1932–9.
. Efficacy of B-cell-targeted therapy with rituximab in patients with rheumatoid arthritis. N Engl J Med 2004;350:2572–81.
. Efficacy and safety of rituximab (RTX) as first-line biologic therapy in patients (pts) with active rheumatoid arthritis (RA): results of a phase III randomized controlled study (SERENE). Program and Abstracts of the 2008 American College of Rheumatology/Association of Rheumatology Health Professionals (ACR/ARHP) Scientific Meeting, 27 October 2008, San Francisco, California, USA: ACR abstract 364.
. Effect of interleukin-6 receptor inhibition with tocilizumab in patients with rheumatoid arthritis (OPTION study): a double-blind, placebo-controlled, randomised trial. Lancet 2008;371:987–97.
. Treatment of rheumatoid arthritis with the selective costimulation modulator abatacept: twelve-month results of a phase iib, double-blind, randomized, placebo-controlled trial. Arthritis Rheum 2005;52:2263–71.
. Infliximab and methotrexate in the treatment of rheumatoid arthritis. Anti-tumor necrosis factor trial in rheumatoid arthritis with concomitant therapy study group. N Engl J Med 2000;343:1594–602.
. Tocilizumab inhibits structural joint damage in rheumatoid arthritis patients with an inadequate response to methotrexate: the LITHE study. Program and Abstracts of the 2008 American College of Rheumatology/Association of Rheumatology Health Professionals (ACR/ARHP) Scientific Meeting, 28 October 2008, San Francisco, California, USA: ACR abstract L14.
. Sustained benefit in rheumatoid arthritis following one course of rituximab: improvements in physical function over 2 years. Rheumatology (Oxford) 2006;45:1505–13.
. Adalimumab, a fully human anti tumor necrosis factor-alpha monoclonal antibody, and concomitant standard antirheumatic therapy for the treatment of rheumatoid arthritis: results of STAR (Safety Trial of Adalimumab in Rheumatoid Arthritis). J Rheumatol 2003;30:2563–71.
. Etanercept and sulfasalazine, alone and combined, in patients with active rheumatoid arthritis despite receiving sulfasalazine: a double-blind comparison. Ann Rheum Dis 2006;65:1357–62.
. The efficacy and safety of rituximab in patients with active rheumatoid arthritis despite methotrexate treatment: results of a phase IIB randomized, double-blind, placebo-controlled, dose-ranging trial. Arthritis Rheum 2006;54:1390–400.
. Interleukin-6 receptor inhibition with tocilizumab reduces disease activity in rheumatoid arthritis with inadequate response to disease-modifying antirheumatic drugs: the tocilizumab in combination with traditional disease-modifying antirheumatic drug therapy study. Arthritis Rheum 2008;58:2968–80.
. Therapeutic effect of the combination of etanercept and methotrexate compared with each treatment alone in patients with rheumatoid arthritis: double-blind randomised controlled trial. Lancet 2004;363:675–81.
. Efficacy and safety of adalimumab as monotherapy in patients with rheumatoid arthritis for whom previous disease modifying antirheumatic drug treatment has failed. Ann Rheum Dis 2004;63:508–16.
. Treatment of rheumatoid arthritis with recombinant human interleukin-1 receptor antagonist. Arthritis Rheum 1998;41:2196–204.
. Patients with rheumatoid arthritis achieve a rapid response when treated with certolizumab pegol irrespective of background treatment. Program and Abstracts of the 2008 American College of Rheumatology/Association of Rheumatology Health Professionals (ACR/ARHP) Scientific Meeting, 27 October 2008, San Francisco, California, USA: ACR abstract 979.
. Etanercept therapy in rheumatoid arthritis. A randomized, controlled trial. Ann Intern Med 1999;130:478–86.
. The AMBITION study: superiority of tociluzumab (TCZ) vs methotrexate (MTX) monotherapy in patients with rheumatoid arthritis (RA). Program and Abstracts of the 2008 American College of Rheumatology/Association of Rheumatology Health Professionals (ACR/ARHP) Scientific Meeting, 27 October 2008, San Francisco, California, USA: ACR abstract 1210.
. Study of active controlled monotherapy used for rheumatoid arthritis, an IL-6 inhibitor (SAMURAI): evidence of clinical and radiographic benefit from an x ray reader-blinded randomised controlled trial of tocilizumab. Ann Rheum Dis 2007;66:1162–7.
. Comparison of etanercept and methotrexate, alone and combined, in the treatment of rheumatoid arthritis: two-year clinical and radiographic results from the TEMPO study, a double-blind, randomized trial. Arthritis Rheum 2006;54:1063–74.
. Effects of anakinra monotherapy on joint damage in patients with rheumatoid arthritis. Extension of a 24-week randomized, placebo-controlled trial. J Rheumatol 2004;31:1103–11.
. Efficacy and safety of certolizumab pegol monotherapy every 4 weeks in patients with rheumatoid arthritis failing previous disease-modifying antirheumatic therapy: the FAST4WARD study. Ann Rheum Dis 2009;68:805–11.
. How good is to switch between biologics? A systematic review of the literature. Acta Reumatol Port 2007;32:113–28.
. 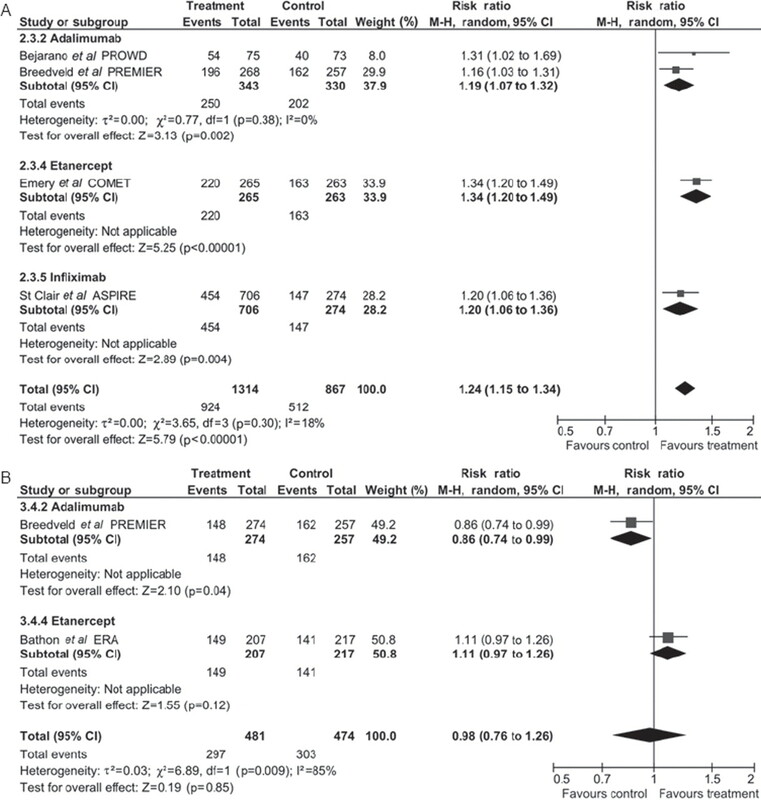 Switching between anti-TNF agents treatments for rheumatoid arthritis: a systematic review. Ann Rheum Dis 2007;66:189.
. Abatacept for rheumatoid arthritis refractory to tumor necrosis factor alpha inhibition. N Engl J Med 2005;353:1114–23.
. Rituximab for rheumatoid arthritis refractory to anti-tumor necrosis factor therapy: results of a multicenter, randomized, double-blind, placebo-controlled, phase III trial evaluating primary efficacy and safety at twenty-four weeks. Arthritis Rheum 2006;54:2793–806.
. IL-6 receptor inhibition with tocilizumab improves treatment outcomes in patients with rheumatoid arthritis refractory to anti-tumour necrosis factor biologicals: results from a 24-week multicentre randomised placebo-controlled trial. (See comment). Ann Rheum Dis 2008;67:1516–23.
. Golimumab significantly improves physical function & fatigue in RA patients previously treated with anti-TNFα agents: results from the GO-AFTER study. Program and Abstracts of the 2008 American College of Rheumatology/Association of Rheumatology Health Professionals (ACR/ARHP) Scientific Meeting, 27 October 2008, San Francisco, California, USA: ACR abstract 1035.
. Updated consensus statement on biological agents for the treatment of rheumatic diseases, 2008. Ann Rheum Dis 2008;67(Suppl 3):iii2–25.
. Disease remission and sustained halting of radiographic progression with combination etanercept and methotrexate in patients with rheumatoid arthritis. Arthritis Rheum 2007;56:3928–39.
. Less radiographic progression with adalimumab plus methotrexate versus methotrexate monotherapy across the spectrum of clinical response in early rheumatoid arthritis. J Rheumatol 2009;36:1429–41.
. Double-blind randomized controlled clinical trial of the interleukin-6 receptor antagonist, tocilizumab, in European patients with rheumatoid arthritis who had an incomplete response to methotrexate. Arthritis Rheum 2006;54:2817–29.
. Risk of serious bacterial infections among rheumatoid arthritis patients exposed to tumor necrosis factor alpha antagonists. Arthritis Rheum 2007;56:1125–33.
. Time-dependent increase in risk of hospitalisation with infection among Swedish RA patients treated with TNF antagonists. Ann Rheum Dis 2007;66:1339–44.
. Treatment for rheumatoid arthritis and the risk of hospitalization for pneumonia: associations with prednisone, disease-modifying antirheumatic drugs, and anti-tumor necrosis factor therapy. Arthritis Rheum 2006;54:628–34.
. Rates of serious infection, including site-specific and bacterial intracellular infection, in rheumatoid arthritis patients receiving anti-tumor necrosis factor therapy: results from the British Society for Rheumatology Biologics Register. Arthritis Rheum 2006;54:2368–76.
. Serious infection following anti-tumor necrosis factor alpha therapy in patients with rheumatoid arthritis: lessons from interpreting data from observational studies. Arthritis Rheum 2007;56:2896–904.
. Emergence of Legionella pneumophila pneumonia in patients receiving tumor necrosis factor-alpha antagonists. Clin Infect Dis 2006;43:e95–100.
. Safety and efficacy of over 10 years of continuous etanercept therapy in patients with rheumatoid arthritis in North America and Europe. Ann Rheum Dis 2008;67:175.
. Treatment of rheumatoid arthritis with tumor necrosis factor inhibitors may predispose to significant increase in tuberculosis risk: a multicenter active-surveillance report. Arthritis Rheum 2003;48:2122–7.
. Tuberculosis infection in patients with rheumatoid arthritis and the effect of infliximab therapy. Arthritis Rheum 2004;50:372–9.
. Risk and case characteristics of tuberculosis in rheumatoid arthritis associated with tumor necrosis factor antagonists in Sweden. Arthritis Rheum 2005;52:1986–92.
. Incidence of tuberculosis in Korean patients with rheumatoid arthritis (RA): effects of RA itself and of tumor necrosis factor blockers. J Rheumatol 2007;34:706–11.
. Risk of tuberculosis in patients treated with tumor necrosis factor antagonists due to incomplete prevention of reactivation of latent infection. Arthritis Rheum 2007;57:756–61.
. The risk of tuberculosis with anti-TNF is higher with monoclonal antibodies than with the soluble receptor. Results of the French 3-year prospective RATIO observatory. Ann Rheum Dis 2008;67:52.
. Drug-specific risk of tuberculosis in patients with rheumatoid arthritis treated with anti-TNF therapy: results from the BSRBR. Program and Abstracts of the 2008 American College of Rheumatology/Association of Rheumatology Health Professionals (ACR/ARHP) Scientific Meeting, 27 October 2008, San Francisco, California, USA: ACR abstract 1263.
. Biologic treatment of rheumatoid arthritis and the risk of malignancy: analyses from a large US observational study. Arthritis Rheum 2007;56:2886–95.
. Tumor necrosis factor alpha antagonist use and cancer in patients with rheumatoid arthritis. Arthritis Rheum 2006;54:2757–64.
. No increase in overall risk for cancer in RA treated with TNF-antagonists, but risks for certain cancer types may be elevated. Ann Rheum Dis 2007;66:54.
. Anti-TNF therapy in RA and cancer risk: relation to duration of follow-up, cumulative treatment, and therapeytic response. Ann Rheum Dis 2008;67:52.
. Risks of solid cancers in patients with rheumatoid arthritis and after treatment with tumour necrosis factor antagonists. Ann Rheum Dis 2005;64:1421–6.
. Tumour necrosis factor blockers do not increase overall tumour risk in patients with rheumatoid arthritis, but may be associated with an increased risk of lymphomas. Ann Rheum Dis 2005;64:699–703.
. No increased risk of solid tumours in patients treated with biologics. Program and Abstracts of the 2008 American College of Rheumatology/Association of Rheumatology Health Professionals (ACR/ARHP) Scientific Meeting, 27 October 2008, San Francisco, California, USA: ACR abstract 1010.
. Is the exposure to TNF antagonists a risk factor for cancer in rheumatoid arthritis? Program and Abstracts of the 2008 American College of Rheumatology/Association of Rheumatology Health Professionals (ACR/ARHP) Scientific Meeting, 27 October 2008, San Francisco, California, USA: ACR abstract 1266.
. The influence of anti-TNF therapy upon cancer incidence in patients with rheumatoid arthritis (RA) who have had prior malignancy: results from the BSRBR. Program and Abstracts of the 2008 American College of Rheumatology/Association of Rheumatology Health Professionals (ACR/ARHP) Scientific Meeting, 27 October 2008, San Francisco, California, USA: ACR abstract 1264.
. Safety and effectiveness of adalimumab (Humira®) is maintained in patients with rheumatoid arthritis-three-year results of realise, a post-marketing observational study. Ann Rheum Dis 2008;67:176.
. Malignancies in the abatacept RA clinical development program: an updated epidemiological assessment with > 10,000 person-years of exposure. Program and Abstracts of the 2008 American College of Rheumatology/Association of Rheumatology Health Professionals (ACR/ARHP) Scientific Meeting, 28 October 2008, San Francisco, California, USA: ACR abstract 1675.
. Rheumatoid arthritis treatment and the risk of severe interstitial lung disease. Scand J Rheumatol 2007;36:172–8.
. Rheumatoid arthritis, interstitial lung disease, mortality and anti-TNF therapy: results from the BSR biologics register (BSRBR) (Abstract). Ann Rheum Dis 2007;66:55.
. Infliximab for the treatment of rheumatoid arthritis. Cochrane Database Syst Rev 2002;3:CD003785.
. A systematic review of infliximab in the treatment of early rheumatoid arthritis. 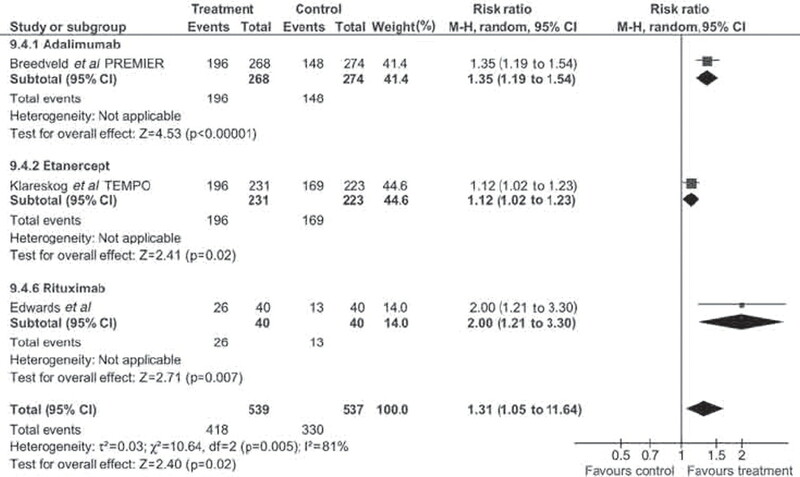 Ther Clin Risk Manag 2007;3:905–11.
. Etanercept for the treatment of rheumatoid arthritis. Cochrane Database Syst Rev 2003;4:CD004525.
. Adalimumab for treating rheumatoid arthritis. Cochrane Database Syst Rev 2005;3:CD005113.
. Tumor necrosis factor alpha drugs in rheumatoid arthritis: systematic review and metaanalysis of efficacy and safety. BMC Musculoskelet Disord 2008;9:52.
. The comparative efficacy and safety of biologics for the treatment of rheumatoid arthritis: a systematic review and metaanalysis. J Rheumatol 2006;33:2398–408.
. Comparison of the efficacy of the tumour necrosis factor alpha blocking agents adalimumab, etanercept, and infliximab when added to methotrexate in patients with active rheumatoid arthritis. Ann Rheum Dis 2003;62(Suppl 2):ii13–16.
. A systematic review of the effectiveness of adalimumab, etanercept and infliximab for the treatment of rheumatoid arthritis in adults and an economic evaluation of their cost-effectiveness. Health Technol Assess 2006;10:iii–iv, xi–xiii, 1–229.
. Meta-analysis of the combination of TNF inhibitors plus MTX compared to MTX monotherapy, and the adjusted indirect comparison of TNF inhibitors in patients suffering from active rheumatoid arthritis. Rheumatol Int 2008;28:553–9.
. The efficacy of inhibiting tumour necrosis factor alpha and interleukin 1 in patients with rheumatoid arthritis: a meta-analysis and adjusted indirect comparisons. Rheumatology (Oxford) 2007;46:1140–7.
. Systematic review: comparative effectiveness and harms of disease-modifying medications for rheumatoid arthritis. Ann Intern Med 2008;148:124–34.
. The clinical and cost-effectiveness of anakinra for the treatment of rheumatoid arthritis in adults: a systematic review and economic analysis. Health Technol Assess 2004;8:iii–iv, ix–x, 1–105.
. Anakinra for rheumatoid arthritis. Cochrane Database Syst Rev 2008;2:CD005121.
. Clinical and patient-reported outcomes in clinical trials of abatacept in the treatment of rheumatoid arthritis. Clin Ther 2008;30:429–42.
. Abatacept in biologic-naïve patients and TNF inadequate responders: clinical data in focus. Curr Med Res Opin 2008;24:2283–94.
. Role of abatacept in the management of rheumatoid arthritis. Clin Ther 2006;28:1764–78.
. Tocilizumab: an interleukin-6 receptor inhibitor for the treatment of rheumatoid arthritis. Ann Pharmacother 2008;42:1660–8.